The agency had to design 44 sku line of high-protein, grain free food. 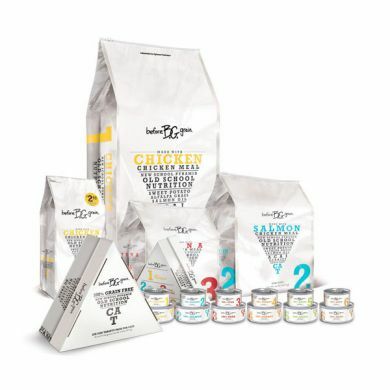 Creative Director, Tyler Merrick, wanted to represent a traditional food pyramid being flipped upside down with the phrase “New School Pyramid, Old School NutritionTM.” The food itself is based on the days before grain was used in commercial pet food manufacturing, so with that in mind, Before GrainTM was born (beforegrain.com). These foods use premium ingredients not found in most pet food, like acai berries, and we used these ingredients to build the rest of the design. The zippered pouches and bags are printed in a matte finish, with the dog foods packaged in black, and the cat foods in white.